Thigh Rigs are a very quick an efficient way of accessing your equipment, while leaving the front of the body or waist area clear. These Thigh Rigs are suitable for military, police and special forces use and are fully adjustable. 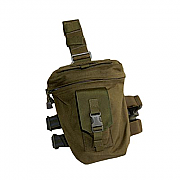 Blackhawk OMEGA Drop Thigh Rig Dump Pouch used for loose ordnance, empty magazines or evidence/contraband. Blackhawk OMEGA Drop Thigh Rig Dump Pouch features easy-access 9 YKK® dual zipper closure, top hook & loop flap over two overlapping layers of heavy duty elastic allows quick drop of items into the pouch, but keeps them securely inside.